Flinders Lane, Melbourne. Easily becoming Restaurant Row of the CBD. Start at one end and eat your way down to the other. I even have a great recommendation for an Air BnB at the starting line — and a few shops and cultural finds along the way. Click map to enlarge. Cumulus — There is no going to Melbourne without a meal at Cumulus. It is my on the record, favorite restaurant in the city. I love it so much, I’ve been known to dine there multiple times on every trip down under — sometimes multiple times in one day given they are open for breakfast, lunch and dinner. It’s been such a love affair, I’ve never even ventured past the front door and up the stairs to their evening wine bar Cumulus Up, Next time I swear. 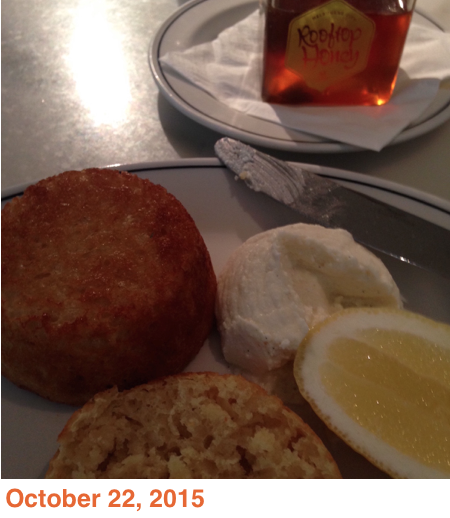 Pictured: House made Crumpets with Whipped Ricotta & Honey. Super Normal — The CBD incarnation of the restaurant I declared orgasmic once upon a time (see here) and another hit in chef Andrew McConnell’s (Cumulus) growing empire. The menu is very similar to its St. Kilda predecessor but the vibe is decidedly more urban and Tokyo neon. And there is a long bar perfect for dining solo. Plus you can order half portions of most things on the menu so you don’t miss out on the multiple tastes, shared plate experience larger parties are having. 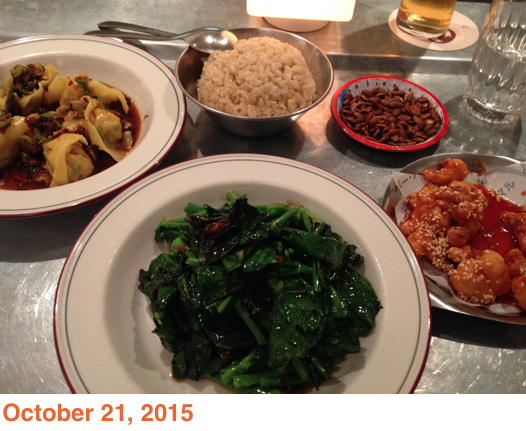 Pictured: Prawn & Chicken Dumplings, Brown Rice, Roasted Pumpkin Seeds (complementary), Spicey Cauliflower, Sauteed Greens in XO Sauce. For dessert: Plum & Green Tea Soft Serve — the perfect cool down after a lot of spice that honestly made me sweat. Laneway Greens — This is my kinda place. Healthy. Yummy. Perfect for everyday fare and the kind of place I could eat at every day. Why is salad so much better when somebody else makes it? But don’t stop at salad — although the 6 seasonal menu choices are spectacular — they also have great smoothies and the occasional soup on a cold winters day. I love this place! I even love the stoneware bowls they serve in. While most people opt for take away, do take a seat at one of the 12 stools and enjoy the stoneware. I’ll be back for sure! 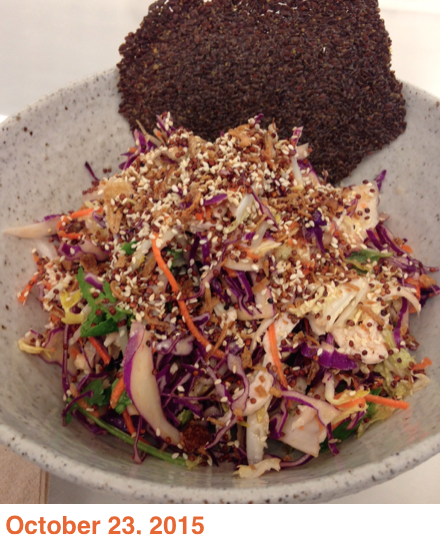 Pictured: Wombok Chicken Slaw with the most intriguing Flaxseed Cracker. Huxtaburger — I’ve been wanting to try a Huxtaburger for years but somehow with the ever growing list of restaurants I bring with me each trip, I’ve made other choices. How stupid of me. 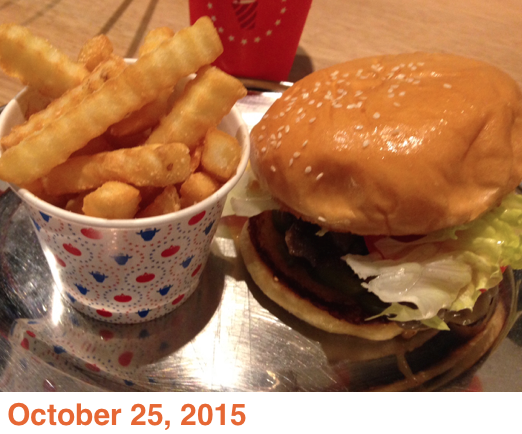 These burgers live up to the hype. My dining partner even declared it “the best burger” he’s ever had. Yes, they are that good. The perfect mix of good beef cooked perfectly pink, lettuce, tomato, pickle, mayo & ketchup on the most delicious brioche bun. Not too small. Not too big. Just right. I’m not normally a fan of the crinkle cut fry either but theirs are just the right complement — fat, fluffy and hot. Truth be told, Shake Shack has nothing on this place. Pictured: Denise (the hot one) Combo Meal. This entry was posted in Australia, Restaurant Visits by mrs. roper's musings. Bookmark the permalink. Hi there! I really enjoy your restaurant round-up and I wanted to ask you a question about your post over email. Would you mind sending me a note at the address provided? Thank you!